As Third and Valley residents, we know that you can’t fit into just one ‘box.’ Our residents come from many different backgrounds with many different lifestyles and tastes. With brand new apartments offering an array of different amenities, we’re happy to have fun-loving millennials, first-time families, hardworking entrepreneurs, adventurous travelers, adoring pet-owners and motivated students all call Third & Valley home. However, we also know that come Saturday night, you may need to unwind and take a breather from your jam-packed week. While there’s no better feeling than coming home from work on a Friday evening, there are nights where you want to get out of the apartment and unwind as well. 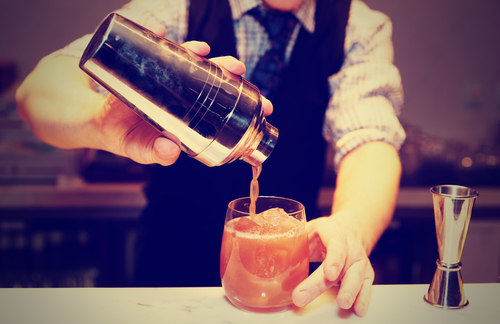 Whether it’s having a glass of wine with your best friend, sitting at the bar and drinking some craft beers with your crew, or keeping it classy with cocktails at a chic lounge, we all have our way of unwinding. Luckily for you, South Orange also can’t fit inside one ‘box.’ Like with city-living you’d find in Manhattan or Brooklyn, the options are endless all around you for an eventful evening. The abundance of Saturday night spots – from beer bars to lounges to clubs – makes South Orange the perfect stop for every type of weekend you’re craving, all pretty close to your Third & Valley apartment. Below are a few of our suggestions for local night outs of all varieties; whether it’s a classy date night, a rowdy sporting event, or a low-key evening with friends. Bunny’s Sports Bar at 14 W South Orange Avenue is known for its mouthwatering thin-crust pizza and other comfort foods such as burgers and pasta. Housed in an easygoing tavern with relaxing sidewalk seating, the sports bar serves as South Orange-ites home-away-from-home. Every weekend and game night you can find tons of locals here to cheer on their favorite team, as well as plenty of regulars who come on a daily basis just to enjoy the company. Everybody may not know your name yet – but a few more visits to Bunny’s Sports Bar and you’ll be glad to call this local bar your second home. Papillon 25 at 25 Valley Street serves more than 50 martinis and a huge selection of wines in an upscale, elegant atmosphere reminiscent of ‘40s and ‘50s supper clubs. Whether it’s date night, an important event, family gatherings, or just some wine and casual conversation at the bar, Papillon 25 is the chic backdrop you want for your classy evening. Don’t miss out on Thursday nights at this stylish spot when you can listen to live jazz music with your cocktails and dinner. Ricalton’s Village Tavern at 19 Valley Street serves classic American dishes in an upscale-casual setting and at The Snug, its authentic Irish pub, you’ll find an ever-changing selection of craft beers and South Orange’s only dart board. Much like pubs in Ireland, The Snug is the unofficial center of town, and you can find South Orange-ites of all lifestyles enjoying their evenings here in their warm and cozy atmosphere. Just a walk down the road from both Third & Valley and the train station, it makes a great place to grab a drink on your way home from work.